Welcome to our historic home originally built in the 1770s and nestled in the heart of New York’s beautiful Hudson River Valley. We’re walking distance from Woodbury Commons Shopping Outlets and perfectly located next door to the Hudson Valley’s popular destinations: minutes away from Bear Mountain, West Point Military Academy, Storm King Art Center, Brotherhood Winery, and more! Return to our comfortable home after shopping, hiking, and exploring all that the Hudson Valley has to offer. Tracing back to the 1770s American Revolution era, with additions built in 1849 and continual renovations since, our home is filled with a historic ambiance and classic interior designs. 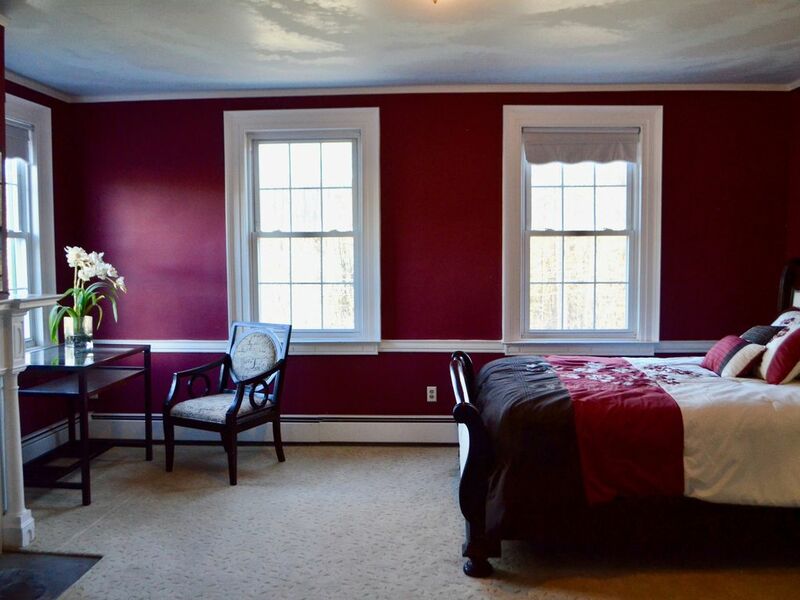 This guest room has a crimson theme with an elegant queen-sized bed and furnishings to make for a comfortable and cozy stay. Stay connected with high-speed Wi-Fi throughout the house. We cannot say enough great things about our stay in Woodbury. The location was perfect for us, as we were visiting our son at West Point, and the drive to/from was only about 20 min. The house itself is gorgeous and very clean. I highly recommend staying here. Can't go wrong. The stay is better then any hotel. The room and bathroom are nice and clean. Plus there's Netflix! The room was spacious and clean the bed was comfortable. A couple of issues though, we did not realize we had a shared bathroom. Fortunately there was no one else staying on our hallway. Plus the room was on the 2nd floor. My wife has mobility issues and if I had know it was a 2nd floor we would have asked for a 1st floor room. 1770 home is meticulously clean and spacious. Bed was amazing and private bath was just outside our door. Great streets to walk on and friendly neighbors too. Owner was quick responder and super to work with as both parties caught in traffic and ETA kept changing. Remarkable experience to add to our bucket list. Thx for sharing your historical home. I loved this room it was beautifully decorated and very well kept. I especially enjoyed the fact that I had my own bathroom to myself. When and if I need to visit out there sometime soon I will definitely be staying there again. The house is gorgeous, our room was spacious and very comfortable. The host is kind and welcoming and helpful.